Fabulous Boys Bedroom Designs Ideas! 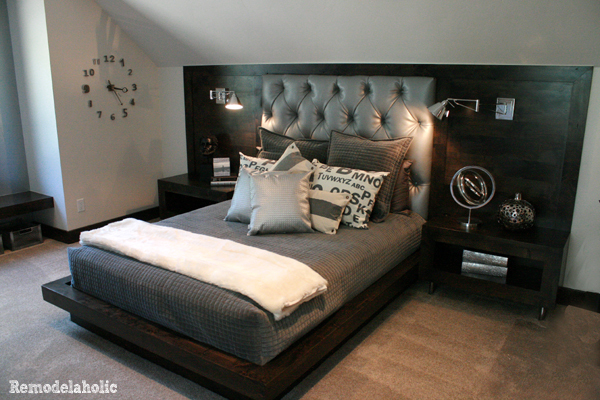 What a cute boys bedroom design! I love the bright blue colors and the fun bunk beds! Boys rooms are a great place to have some fun in design. The colors can be bright, or neutral. But all ways, we love some great inspiration, (right) like these great boys bedroom designs I loved at some of the recent homes shows I’ve been to (and a friends house). *Update: We have had a ton of questions about the airplane panel art, so we did some looking. We found similar pieces available at Pottery Barn, and on Etsy. We even found a DIY version from The Cre8tive Outlet. Now to see how Anna created her fabulous boys bedroom design, and see what hints you can pick up from what she did read on! Anna stared Take the Side Street, a blog dedicated to the 5 D’s (decor, design, DIY, doughnuts & dumb stuff) in August 2010 and has been attacking home projects and maple bars since then. She lives nearish to such fabulous places as Yellowstone and Jackson Hole and takes advantage of the time her husband spends out fly fishing to knock holes in things or rip up carpet. Together with her husband she has two young sons, the world’s only high strung Golden Retriever, a cat with an attitude, a depressingly long-lived goldfish, and 5 chickens (because everybody knows that the 7th wedding anniversary gift theme is poultry, but even more so because she doesn’t think decisions through properly). She believes in being authentic, having fun, trusting your gut and never taking yourself too seriously. Oh, and in maple bars. And cute shoes… and in being kind and recycling. And lists. Here it is! I’m thrilled with how the room turned out, even if it’ll never look like this again because (my) boys will be (messy) boys. Details and sources will go up next week (update: here they are) — if there’s something specific you want to know about, make sure to ask in case I start forgetting things. Have a great weekend! Check out these other fun boys bedrooms! where did you find the chair for the desk area? I love these pics…boys rooms can be so much fun! My little guy can get lost in the shuffle with his girly sisters so this was a nice reminder to make his room special too! I have five boys, so I am loving this! Thanks! This post sounds very timely for you then! I am glad you like it! Where do I get those bunk beds??? Love the blue bunk beds! Where did you find them? They look like the beds at Walmart? Do you happen to have any clues as to where the pillow in one of the room pics comes from. It’s the one in the room with 2 beds and the pillow says “the elephant”. Thanks for any leads! Sorry, Dessie, we don’t know where it is from. Just got one similar to the 6th one from Amazon on last Monday: https://amzn.to/1kOeFYm – This is wonderful, my son is going to be so happy. I loved all of the designs and had a hard time choosing. Just thought I’d share. Hi I love the blue and white pillows on the beds. Where did you get them from?